After Schubert died in 1828 his brother Ferdinand gave the manuscript to Schumann who then passed it to first publisher K.F. Whistling. Whistling presumed the sonata was left incomplete because of the composer’s death and erroneously gave it the nickname “Reliquie” (Relic). Schubert scholar Brian Newbould reminds us that Schubert rarely had a keyboard handy. We can presume D. 840 was written away from an instrument. Several late sonatas were conceived this way, which may explain their innovative structure and harmony, and the absence of traditional keyboard gestures and patterns. Because material is often specific to register, the Reliquie’s Moderato does have an orchestral compass. Some program annotators giddily compare the finished movements to later compatriot Bruckner. The listening and performing majority consider D. 840 a two-movement work. Indeed, Gilbert Kalish’s LP (Nonesuch H-71386) forged my initial impression. Two new releases take this standard approach, programming only the completed Moderato and Andante. Franz SCHUBERT: Sonata in C major, D. 840, “Reliquie” (1825); Six German Dances, D. 820; Hungarian Melody, D. 817 (1824); Sonata in D major, D. 850 (1825). Shai Wosner (pno). Onyx 4073 (http://www.onyxclassics.com/). Distributed in the US by Harmonia Mundi (http://www.harmoniamundi.com/). Franz SCHUBERT: Sonata in D major, Op. 53, D. 850 (1825); Sonata in G major, Op. 78, D. 894, “Fantasy” (1826); Vier Impromptus, Op. 90, D. 899 (1827); Sonata in C major, D. 840, “Reliquie” (1825); Drei Klavierstücke, D. 946 (1828). Paul Lewis (pno). Harmonia Mundi HMC 902115.116 (http://www.harmoniamundi.com/). Wosner follows D. 840 with the diminutive Six German Dances which Webern later orchestrated. I recalled Webern’s own scratchy recording, and found the dances a fitting complement to the Relic. A familiar Hungarian dance precedes the D major sonata D. 850. 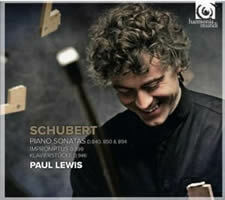 Lewis offers a wide late-Schubert slice. Where the more familiar pieces such as the Impromptus and G major Sonata have verve and passion, it sounds as if his heart wasn’t in the Reliquie. Lewis downplays the Andante’s vast range. The first rubato dose of Drei Klavierstücke, which follows directly, reveals graceful attention. Wosner or Lewis? Different pianos and acoustics separate Wosner’s theatrics from Lewis’ intimacy. Wosner constructs a fine program, but Lewis’ D. 840 is his least. Few pianists look beyond the Moderato and Andante to explore the Menuetto’s migrations or the unexpectedly light-hearted Rondo. Completed or not, the unfinished movements are worth a listen. We’ve four ways to approach these torsos: ignore them, stop when the notes run out, try to guess what Schubert might have done, or wander off the rails. A YouTube trip reveals that Sviatoslav Richter breaks abruptly when there is no longer material for both hands. In Schubert’s draft, the Menuetto’s right hand continues alone for five measures. In the Rondo, the right hand takes two bars by itself. An abrupt modulation occurs if the Trio follows the Menuetto sketch. As academically unsettling as it may be to jump from a suggested D major to G-sharp minor, many pianists take this path, including Ralf Gothóni (Ondine ODE797-2), Gottlieb Wallisch (Naxos 8.570118) and Michel Dalberto (Denon 81757 6330 2). These last three try the Rondo and halt when Schubert did, as a mild surprise only because Schubert just turned a corner into the major. I’ve a well-established fascination for Schubert arrangements and even poor theatre treatments. No surprise, then, that I offer an inventory of D. 840 completions. Having gazed at the sketch for so long — repeated listening means ever more instances of Schubert’s beginnings — I’m now a pretty good judge of what constitutes convincing Schubert, which is to say, I see faults everywhere. 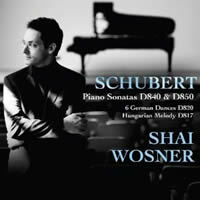 It’s interesting that most add new transitional material rather than develop what Schubert left. The Menuetto offers patterns to modulate upwards by a semitone (from A-flat to A) and a major third (from A to D-flat). All the melodic material derives from the opening bars. No one should invent new melodies. Intriguingly, Schubert marked an accelerando in the Menuetto which requires a tempo change as well as modulations. Fortepiano fans have options: Malcolm Bilson (Hungaroton HCD 41006 or Hungaroton HCD 31590) offers his modest Menuetto completion which essentially concludes the phrase and lightly ornaments the Trio. He omits the Rondo. Paul Badura-Skoda (Arcana A 408) provides modulation bridgework for the Menuetto and a proper development for the Rondo. I find Badura-Skoda’s completion inventive and seamless, yet the requirement to reprise the Moderato’s themes looms grandiosely. Via YouTube we can hear Constantine Firehouse deliver William Bolcom’s Menuetto on a Tröndlin fortepiano. Bolcom remains close to home by exploring Schubert’s materials a bit more than others while engaging in fresh rhythmic / harmonic patterns. Ian Munro’s D. 840 completion along with other Schubert lives on Tall Poppies TP079. The convincing Menuetto resolves after a few slight detours including a coda. The dramatic Rondo invents variations and develops extant material, with Schubert’s harmonies prevailing. Grand flourishes conclude with an extended coda. Given the finale’s lighter character compared to the first two movements, I would have expected it to end quietly. 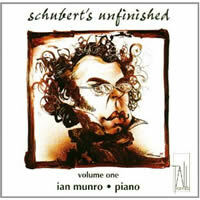 Munro’s program suggests that Schubert’s C major’s fruits often wither on the vine. D. 348, which would have likely been in ABA form, receives a coda. Another ternary candidate, D. 900’s central section trails off quickly with Munro extending the incomplete five-plus bars. As the sketch stands, the D. 605 Fantasy could go anywhere. Munro solves the broken section with a recap and coda. The F-sharp Sonata’s opening (D. 571) strikes me as facile and early, contrasting with the sober D. 604 Andante, which Munro programs next. Both Scherzo / Trio and Allegro finale are D. 570. The outer movements in this recasting required Munro’s completion. Of course Schubert-scholar Newbould touched D. 840. Todd Crow (Toccata TOCC0065) provides new figurations and different harmonic directions for the Menuetto and takes the Trio slowly. The Rondo discovers different keys and enhances the melody with parallel thirds. I would not have expected Newbould to be so inventive. Perhaps he’s incorporating other unresolved Schubert snippets. Anthony Goldstone’s Menuetto (Divine Art DDA21204) wraps quickly with slightly outré harmonies. Goldstone’s Rondo plows through a spirited lineup of phrases and abrupt modulations hinting at a post-Schubert world. Michael Louis Benson itemizes other completions in A comparative study on the published completions of the unfinished movements in Franz Schubert’s Sonata in C Major, D. 840 (“Reliquie”), including Bart Berman (Erasmus WVH 203-204) and Martino Tirimo (EMI. CD EMX 2282). Ernst Krenek worked on his completion between 1921 and ’22. That practically no one plays it today should be a fair indicator. The benevolent Internet community makes it possible to hear Ray Lev’s hysterically fast 1947 recording. Could the online transfer have contributed to its comic frenzy? Lev’s Moderato without repeats speeds across at 7:26 and the Andante passes in 7:03. These are usually on the order of 15 (with repeats) and 10 minutes respectively. Krenek grapples with the Menuetto’s modulations, introducing chord changes within its measures, thus breaking Schubert’s pattern. The last movement becomes a sonata allegro with a transitional passage glimpsing the future. The coda recalls the first movement. Opportunities to be harmonically daring or even triumphant dissolve into a modest close. 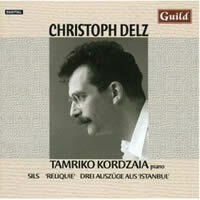 Christoph Delz’s continuation (Tamriko Kordzaia on Guild GMCD 7297) is defiantly hallucinatory and dissonant. It is impossible not to draw parallels between the Viennese composer cut short in his prime and the Swiss composer / pianist felled by AIDS. We arrive at the Trio through a wrong note, and a later transition includes temporal diminution, wrong chords and a misplaced measure. Delz doesn’t permit a full da capo Menuetto restatement. He halts mid-phrase and launches into the Rondo that disintegrates after Schubert’s sketch ends. Delz remembers the original rhythms, and rondo-like, attempts to resurrect Schubert’s gestures that appear in wrong keys and tempos, travel backwards, or are obscured by material from other compositions (the “Unfinished” symphony in particular). Most likely we hear material important to Delz. The final notes echo the Sonata’s opening. Kordzaia has no trouble switching gears, and the Schubert-Delz opus satisfies immensely.